Ashley Diana Morris has had a fairy tale year. The gorgeous Vancouverite who bears a strong resemblance to Anna Nicole Smith was named the face of Guess Lingerie and Bikini last January, rocketing her to instant fame in the fashion world. But that wasn't quite the best part of the Pickering, Ont.-born model's 2013. No, the apex of her year was when she married West Vancouver dentist Geoffrey Gillespie in front of 80 people in the Bahamas on Nov. 9. "I got the marry the man of my dreams," she told The Huffington Post B.C. "That is first and foremost the best thing that happened to me this year." 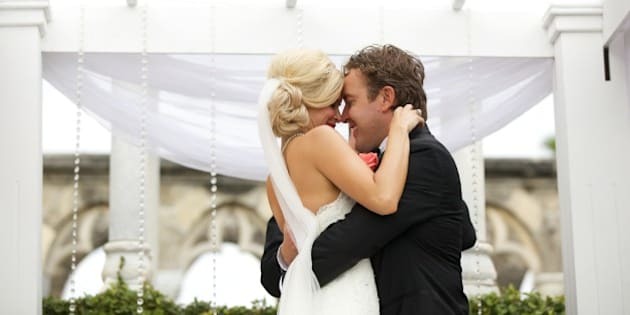 Morris and Gillespie met through the dentist's friend, Bryan Henry, who first encountered the future supermodel while she was working as a bartender at Toronto's Harbour 60 Steakhouse in 2010. She was studying sports journalism at Centennial College at the time. Henry soon sent Gillespie a text: "I just met your future wife. You can thank me later." The two exchanged e-mails and learned that they had a lot in common. Gillespie flew out to Toronto and Morris picked him up at the airport. They did long distance for about six months before she moved to Vancouver. He proposed two years later, at the very place where they met in person. Morris and Gillespie shared the task of planning the wedding. Wanting to avoid the Vancouver rain, they nearly chose Niagara-on-the-Lake before settling on the $14,000 per night One and Only Ocean Club on Paradise Island in the Bahamas. It was the very same resort where "Casino Royale" was produced, and the soon-to-be-married couple stayed in the suite where Daniel Craig filmed a steamy scene with Caterina Murino. "We were in shock, they must have liked us a lot," Morris laughed. The bride wore a lace Maggie Sottero dress as the couple tied the knot at the resort's Versailles Gardens. Everything went to plan except the reception, which they had to move to a covered area after the rain started coming down. The newly-married couple then spent an additional six days in the Bahamas before flying home. January marks the start of a busy year for Morris as she travels to Germany, then Miami and New York. It isn't always easy for the couple to see each other. "He doesn't mind getting on a plane to come visit me for weekends and I'm so used to flying out," Morris said of her husband.